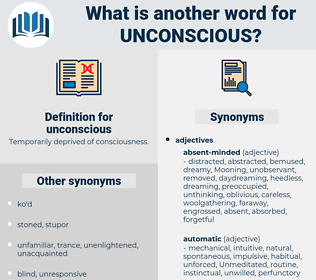 What is another word for unconscious? methodical, designed, straight, organized, planned, systematic, careful. intelligent, educated, talented, knowledgeable, literate, wise, competent. aware, awake, intentional, intended, decided. mindful, knowing, resuscitated, sensitive, hip, cognisant, taught, Grounded, schooled, witting, up-to-date, revived. I thought she was asleep, but I am afraid she is unconscious. Indeed, he seemed unconscious, for a time, of the presence either of Amber or of Doggott. 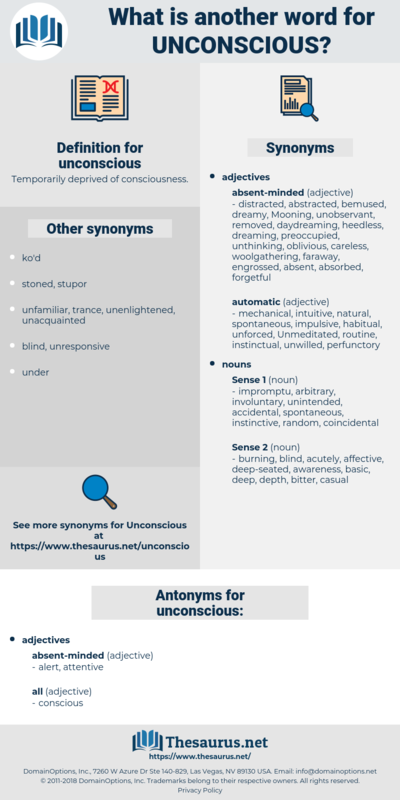 head, brain, psyche, nous, mind.